The long, dramatic saga involving the controversial Dakota Access pipeline took another turn over the weekend. On Sunday, the U.S. Army Corps of Engineers halted work on the line and announced it will look for an alternate construction route. December 2014: Energy Transfer Partners LP (NYSE: ETP) applies to build the pipeline, which would stretch 1,1772 miles across four states and pump 570,000 barrels of oil per day. March 11, 2016: Iowa becomes the final state to approve the plan for the pipeline. April 1, 2016: Members of the Standing Rock Sioux stage a protest on horseback because the pipeline will pass through the tribe’s sacred land. April 29, 2016: The Standing Rock Sioux petition the U.S. Army Corp of Engineers to further investigate the environmental impact of the pipeline. July 27, 2016: The Standing Rock Sioux file a lawsuit against the U.S. Army Corp of Engineers seeking an immediate halt to construction. August 1, 2016: Protesters set pipeline construction equipment on fire in Iowa. September 3, 2016: Protesters are attacked by guard dogs and maced by private security at a construction site in North Dakota. 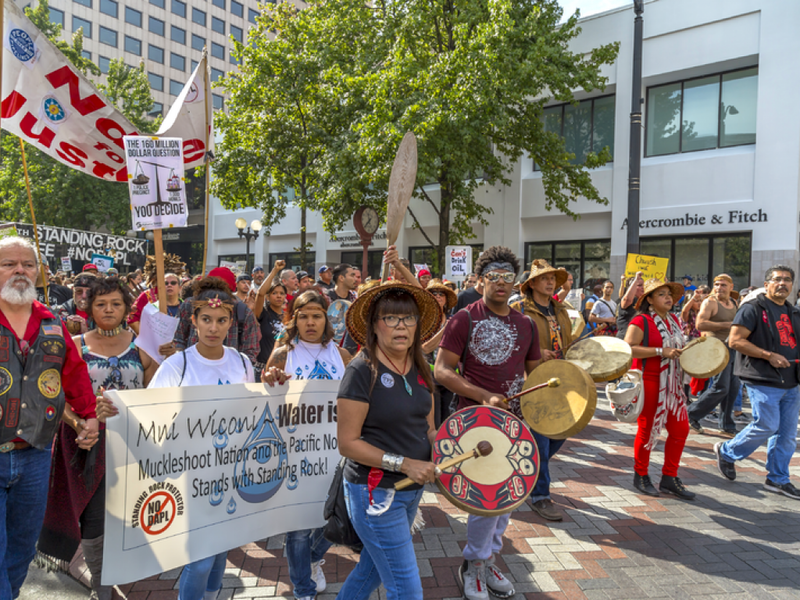 September 9, 2016: A U.S. district judge denies the Standing Rock Sioux’s request for an injunction outside of a small area of land in the Lake Oahe region but halts construction of the pipeline in that area until further environmental studies are conducted. 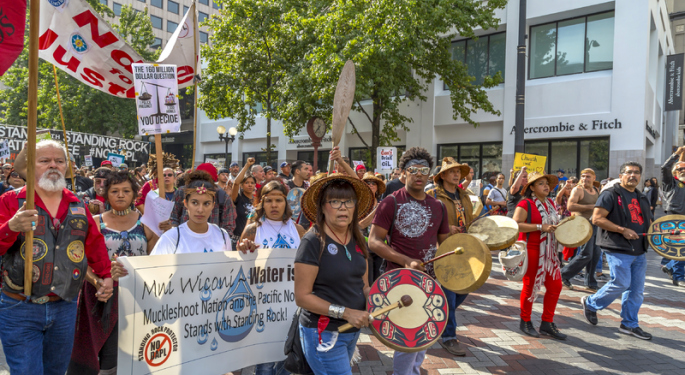 October 9, 2016: A federal court denies the Standing Rock Sioux’s appeal and rules that construction of the pipeline can continue on private land. October 10, 2016: Actress Shailene Woodley is arrested for trespassing at a protest site in North Dakota. October 27, 2016: The most explosive protest to date erupts when protesters set fire to construction equipment. Police use pepper spray and fire bean bags to break up the protest and arrest 140 people. November 14, 2016: The U.S. Army Corp of Engineers announces it will halt construction pending further consultation with local tribes. November 15, 2016: Former presidential candidate Sen. Bernie Sanders joins protesters in Washington on a national day of action to protest the pipeline. November 20, 2016: Police spray protesters with water cannons and shoot them with rubber bullets. December 3, 2016: About 2,000 U.S. veterans arrive at the protest site as part of the Veterans Stand for Standing Rock group. December 4, 2016: The U.S. Army Corp of Engineers denies an easement allowing construction to continue across Lake Oahe, bringing work on the pipeline to a stop. Shares of Energy Transfer Partners, Energy Transfer Equity LP (NYSE: ETE) and Sunoco Logistics Partners L.P. (NYSE: SXL) were all down in pre-market trading on Monday.